Introduction to welding power sources, various types, applications, useful definitions, relative advantages, disadvantages, what is an inverter in general, different power semiconductors used in inverters, different design topologies, Arcrafts welding inverters and comparison of costs. Welding is a process of joining two metals. To make a joint of two metals immense heat is required. This heat is created in the form of an electric arc. To create this arc a power source is required. Ever since the process of welding entered the engineering field there is continuous innovations in the field of welding power sources. The choice of a welding power source depends upon the process of welding. There are two types of welding power sources. A constant current power source is used in MMAW and TIG welding processes. MMAW stands for manual metal arc welding. TIG stands for tungsten inert gas welding. A constant voltage power source is used in MIG/MAG and SUBARC welding processes. 1.MIG stands for metal inert gas welding. 2.MAG stands for metal active gas welding. 3.SUBARC stands for submerged arc welding. The following are the types of welding power sources that can be differentiated based on value based parameters. 2. 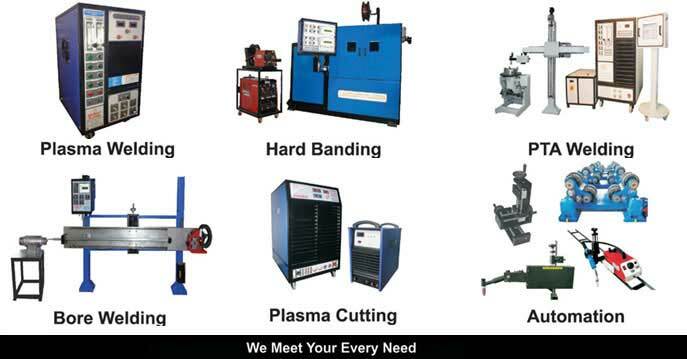 DIFFERENT TYPES OF WELDING POWER SOURCES. A2.Variable current welding transformer (magnetic shunt type). B1.Transductor type welding power source (welding rectifier). B3.Chopper based welding power source. B4.Inverter based welding power source. 1. Power factor: It is the ratio between active power and the sum of active and reactive power. It should be noted that it is a vector sum not an algebraic sum. 2. Input KVA: It is the product of voltage applied and current drawn from the input power supply. 8. Open circuit voltage :This is the voltage available at the output terminals of welding power source when welding is not being carried out. 9. Load voltage: This is the voltage available at the output terminals of welding power source when welding is being carried out, given in Volts. 10. 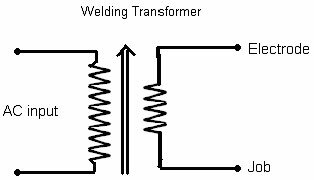 Welding current: This is the current drawn from the output of welding power source given in Amperes. 11. No load input current: This is the current drawn from the input power supply when welding is not being carried out. 12. deposition rate: It is the weight of material deposited in unit of time given in Kg/Hr or Kg/Min, under a given set of conditions. It is dependent of the power source also. It is reduced due to spatter and fumes. In a typical test it increases by about 15 to 20 % when welding inverters are used. 13. Melting/Burn off rate: It is the rate at which the electrode of specific size is melted by a set current and is expressed in cm/min. It increases rapidly as current is increased specifically for small diameter electrodes. 4.A1. 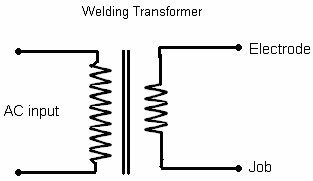 Fixed current welding transformer. 2.Simple to use and service. 1.Very high no load current. 2. There is no control of current. Current is fixed, will also depends on the electrode and input voltage. 5.Due to 1 and 2 draws very large current from the electricity establishment. (see the table). 6.Due to 3 running cost is high. 9.Welding at low currents is not at all possible. 10.Bulky equipment, thus occupies large floor space. 12.TIG / Argon welding not possible. 13.Welding of non- ferrous metals not possible. 14.Lower deposition rate and deposition efficiency. 4.A2. Variable current welding transformer (magnetic shunt type). 4.Due to 1 and 2 draws very large current from the electricity establishment. (see the table). 5.Due to 3 running cost is high. 7.Better control of current compared to the previous type but not satisfactory. 8.Bulky equipment, thus occupies larger floor space. 9.TIG / Argon welding not possible. 10.Welding at low currents is not possible. 3.Moderate skill required to service the equipment. 2.Efficiency is better than the earlier cases but not high. 4.Due to 1 and 2 draws large current from the electricity establishment. 7.Better quality of weld compared to the previous types. 8.Better control of current compared to previous types. 9.Bulky equipment, hence occupies large floor space. 11.Averaage deposition rate and efficiency. 5. WHAT IS AN INVERTER? An inverter used in the welding application functions as below. AC Line voltage is taken as the input to the welding equipment. It is suitably RFI/EMI filtered and rectified. This rectified voltage is filtered to make it pure DC. This Dc voltage is taken as the input to the switching device through a high frequency power transformer. As this switching frequency is very high the size of this transformer becomes very small compared to its counter parts. The transformer output is suitably stepped down. This stepped down AC voltage is again rectified using fast recovery diodes. This output is used for welding. Suitable controls and feedback techniques are used. Very large capacity devices are available, which are very rugged. Very low frequency of operation, which is well within the audio range. Gate drive is simple and efficient. Hence size and weight of the equipment is large. As the frequency of operation falls well in the audio range, welding is very noisy. As the commutation is forced, large and more number of components. Speed of current control is slow and hence a very low welding current is not possible. High spatter and fumes. Poor quality of weld. Large internal heat due to large circulating current. All the above Drawbacks are eliminated, but It requires bulky and inefficient base drive, which is complicated and not suitable at high powers. High power transistors are extremely expensive. As the technology is advanced with IGBTs and MOSFETs there are no takers for these devices in welding application. In this device base is replaced by a gate. Gate drive is simple and extremely efficient. Very high switching speed, and hence transformer size becomes small. Operation up to100KHz is easily possible. At larger duty cycles and higher power capacities size of transformer core has to be suitably selected to accommodate the adequate size of copper conductor. 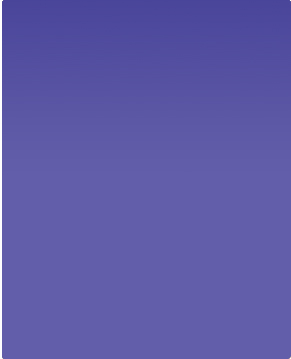 Large capacity devices are not popular due to their cost and availability. Hence used in low and medium capacity power sources. 6d. IGBTs (Insulated Gate Bipolar Transistors). It is a combination of BJT and MOSFET. Very simple and efficient gate drive. Large capacity devices are available at reasonable cost. Reduces assembly and servicing time. Operation possible well above audio range and hence noise free operation. Only device available for large capacity power sources. Power loss is comparable to MOSFETs at low powers and lesser at medium and higher powers. And hence building block design concepts can be applied. 7.a. Resonant power sources carry the disadvantage of large circulating current, bulky size due to commutating circuits. Hence they are less efficient. They offer less control bandwidth and hence wide variation of current is not possible. They produce less electromagnetic interference. Hence they are old generation for welding application. They are used at very high frequency typically 400KHz to 1000KHz in the field of communications, where EMI is a serious concern. 7.b. PWM power sources are the choice of the day as they offer large and fast control. EMI problem is suitably reduced using filters. They provide wide control of current typically from 3 to 400A, which is a very wide range. They provide a great opportunity to incorporate more features. The speed of correction is exceptionally advantageous to control current surges which is a necessity in TIG welding application. The PWM technique offers a smooth short circuit current control, a very good arc re-striking capability. And hence it is the latest and best choice for welding application. 7. HOW ARCRAFTS EQUIPMENT IS BETTER THAN OTHERS? 1.Designed for wider input voltage fluctuations. 2.Designed for wider ambient temperature fluctuations. 3.Protected for under voltage, over voltage, single phasing and over temperature. 4.As many features are provided as required by the customers choice. 5.Ther is no surge of current, starts from the set value of current. 6.Very large number of models to choose from. 7.Tried and tested for quality. 8.Indegeniously designed and hence easy serviceability. 9.Trained manpower to provide service at your doorstep. 10.Very low down time as all the spares are easily available. 11.Due to high operating frequency of the inverter, very low ripple and due to this the welding current is smooth and stable. Excellent weld quality is produced. 12.Uniform weld beads, low spatter, and lesser fumes. 13.Very high deposition rate and efficiency. 14.Latest PWM technology using IGBTs. Input voltage is 230V AC in the case of single phase and 415V AC in the case of three phase input power supply. While comparing in an actual measurements the input voltage and output voltage has to accurately measured. Also we can calculate the saving in the installed capacity, which will also saves on electricity bill. This calculation is for 4mm electrode and for larger electrode sizes the savings will further increase.